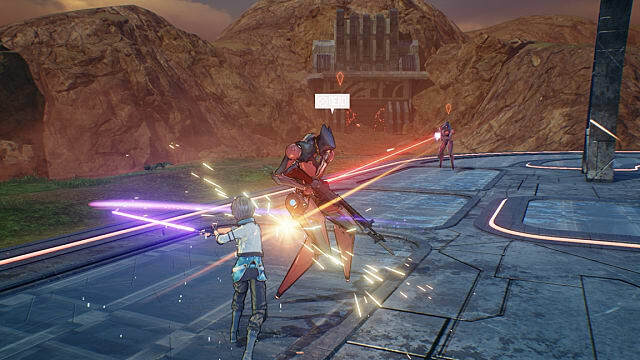 Sword Art Online: Fatal Bullet is a party-based JRPG shooter modeled after the second season of the popular anime Sword Art Online. 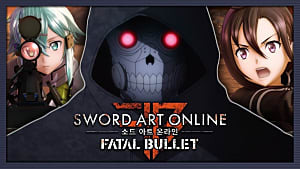 It follows the story of Kirito and his friends in the VRMMO Gun Gale Online. Unlike the name suggests, however, this is not an MMO. This is an RPG with not one but two single-player campaigns and a couple of basic modes for playing online co-op and PvP on the side. It's not your typical RPG shooter, either. There's a unique Aim Assist box that automatically targets enemies, prediction lines for bullets, and a number of other special features that really make this quite a unique game in its own right. 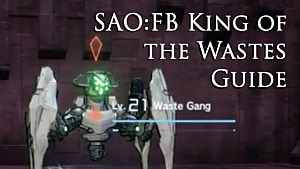 So is SAO:FB worth your time, or should you pass it by? Let's dive in! 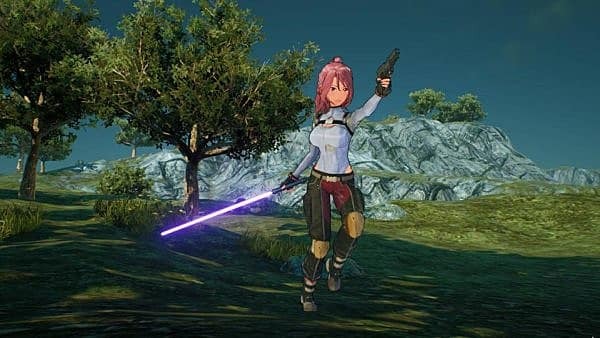 This game's story picks up where Sword Art Online: Hollow Realization left off. (Note that I have not played any of the previous games in the series and so I won't continue to reference them in this review.) Kirito and his friends have just joined Gun Gale Online and have started to make a name for themselves when they meet a few new friends. One of these new friends is the customizable Main Character that you'll find yourself behind the wheel of for most of the adventure. I'm happy to report that there are just enough character customization options to make each character feel unique, but it's nothing that'll blow you out of the water. Additionally, if you find yourself regretting some decisions you made in character creation, you can go back and change anything you want -- except name and gender -- for free at any time. Of course, all of this also applies to your ArFA-sys companion that you receive at the beginning of the game. They're essentially an Artificial Intelligence that not only has your back in combat but also helps you with your banking and investments. They're the only NPC in your party that you can actually allocate stats for, allowing them to play the role of exactly what you need to complement your Main Character. During the introductory sequence, tutorial popups are well-timed and help you adjust to the flow of gameplay at a rather natural pace. However, as soon as you're properly let loose, the game drops a lot of tutorials on you all at once, and some of them talk about systems that aren't quite relevant to you yet -- even if they soon will be -- making them, sadly, easily forgettable. Granted, the tutorials are in the pause menu if you ever need a refresher. However, the overload of tutorials that flood you after the introductory sequence made the early stages of SAO:FB feel unnecessarily convoluted. For example, there's a medal system they introduce here that allows you to turn in medals you earn out in the field in order to earn more Skill Points or gain access to other important items, and totally forgetting about this feature like I did honestly makes the game so much harder than it needs to be. Thankfully, any tutorials after this point are generally well-timed and easy to remember, so if you can muscle through the initial hiccup, the rest of the game is fairly easy to grasp. After a big chunk of the tutorial is out of the way, the game starts introducing you to its colorful cast of characters. As someone who's actually watched the anime all the way through, I have to say that the way the characters are depicted here struck me as rather odd. I'm not sure if it's shoddy localization -- I'm no localization expert, but it doesn't really feel that smooth here -- or if it's the way the characters were written to try and intertwine the events of the anime with an original story that threw me off. To be fair, the characters weren't exactly all that in the anime, either. Their personalities are strong, though, and while there may be some awkward moments, the vibrant cast of characters actually provides some rather interesting dialogue to help you get through an unfortunately drab main story mode. I won't say much about the story, but I do want to touch on one little interesting tidbit. There are not one but two stories in Sword Art Online: Fatal Bullet. 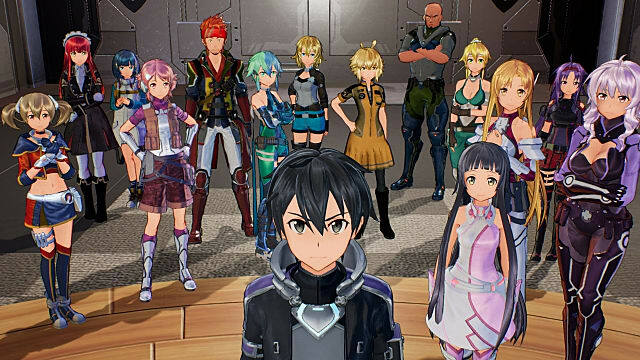 After you reach a certain point in your Main Character's story, you can load the game into Kirito Mode to play as Kirito through a retconned version of the events of the anime. Interestingly enough, it actually follows the anime strangely well, even if they had to tweak a lot of the details to make up for all the inconsistencies. In Kirito Mode, you can essentially do anything you could with your Main Character. You can use the Ultimate Fiber Gun, form a party with four people, and even travel around and go on side quests together. However, you can't change Kirito's stats or equipment at all, so what you see is what you get. 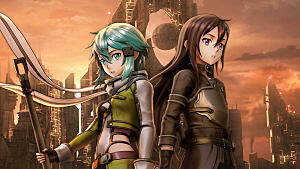 Overall I think Kirito Mode was a nice way to add that story to the game whilst still allowing you the room to have a personalized Main Character of your own. 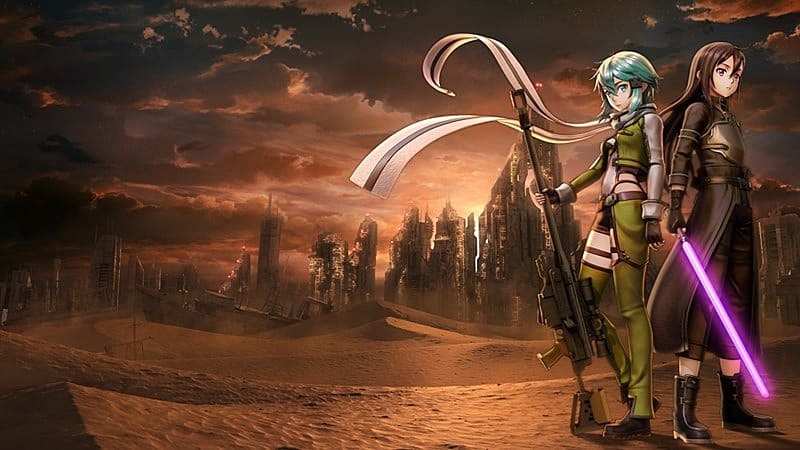 Gun Gale Online is set on a planet that was the site for some space war several years prior. There's only one real functioning city in this game, and it serves as a sort of HUB town. It's well designed and has a plethora of fast travel points, making it incredibly easy to get around. There are plenty of fast travel points out in the open maps and dungeons, too, so you'll never have to worry about making a trek back to anyplace you've actually been before. I don't especially enjoy how the open maps and dungeons were designed, however. While the first map was okay, the rest of the maps simply felt empty. Not only was there not much to do, but while wandering around the map, I often felt like I was walking in an area of the game that was meant to be out of bounds. It simply didn't feel finished. Dungeons, on the other hand, are a little more interesting in design. However, they're such a linear affair that it feels like they discourage exploration even though there are plenty of goodies hidden behind nooks and crannies. If you can get over these environmental quirks, however, you may find the gameplay and combat interesting enough to dip your toes into. As a JRPG shooter, the gameplay is a little bit more unique than what we're used to in modern games. While simply calling it a "shooter with RPG elements" wouldn't be entirely wrong, it doesn't give much credit to the more unique features that really make this a different kind of shooter altogether. For example, there's a togglable Aim Assist feature that helps out with your ability to run and gun without missing your target too much. It's essentially just a box in the center of the screen that zeros in on the closest enemy within that box. On top of that, if the enemy is targetting you with their ranged weapons, you'll notice red Prediction Lines popping up to indicate the trajectory you can expect the next shot to take. 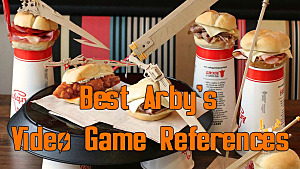 Now, you're probably thinking, "Hold up, this sounds like cheating!" And normally I'd agree with you. Except you have to remember that this is also a JRPG. You're fighting bosses with massive amounts of health and attacks that pack a real punch -- you need all the help you can get to stay on top of the situation. You're also perpetually equipped with an Ultimate Fiber Gun that acts more like a pure utility tool than an actual weapon. With it, you can target any surface and grapple straight to it, giving you a range of mobility that far outclasses that of your party members. It can also be used to stun airborne enemies and steal items from them, but don't expect it to be doing any damage. Then you have more traditional RPG elements like Skills and Gadgets. Skills are sort of like special abilities and powerups that you equip to your weapon loadouts. Gadgets, on the other hand, are specialized tools that you can buy and equip to your character that offer various other benefits out in the field. If you had to compare it to a right and proper RPG, the Skills would be most similar to magic, while Gadgets are closer to a rogue's tools. All of these different features round out to make a very robust combat system. With so many unique mechanics slathered in, it's plain to see that there's no other game quite like it. But is that a good thing? 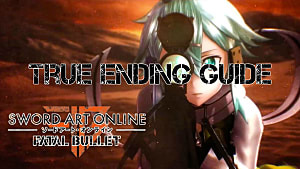 Sword Art Online: Fatal Bullet certainly has its problems, but it boasts such a unique concept that its imperfections can almost be overlooked. I found myself having a better time than I thought I would, even though neither JRPGs nor shooters are really my cup of tea. 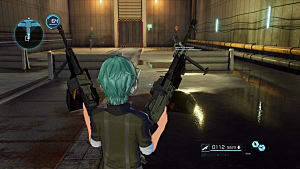 If you like the idea of a JRPG shooter with unique combat mechanics, SAO:FB pulls it off so well that it's certainly worth the try. If you can get over the rough tutorial, the somewhat cringey dialogue, and the generally empty maps, this game will treat you well. 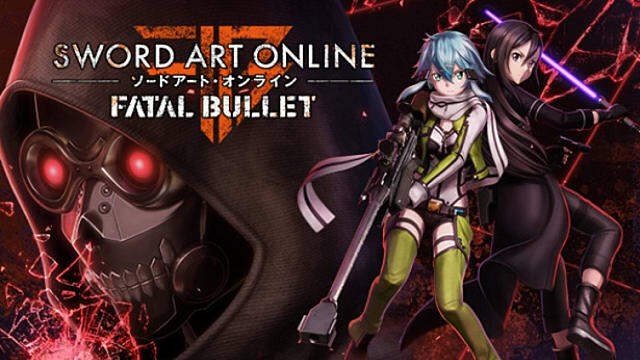 Sword Art Online: Fatal Bullet is available now on Windows PC, PlayStation 4, and Xbox One for $60. Note: A review copy was provided for review by the publisher. 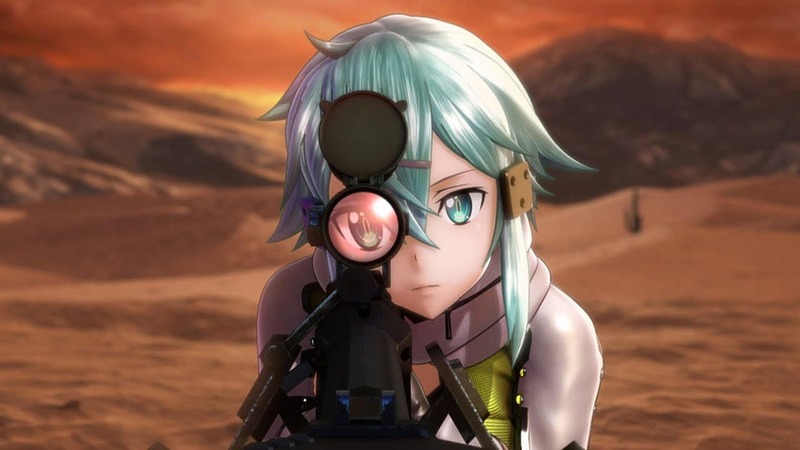 Sword Art Online: Fatal Bullet may have its problems, but it is a rather fun and unique JRPG shooter in its own right.